mostly marathons. usually in the morning. sometimes while pushing a kid or two. Coming off a slightly disappointing finish at the Newport Marathon, I’m reminded of my worst marathon experience ever. In 2007 I started an evening masters program at Arizona State while continuing to work full time. I had always considered myself a runner, but I wasn’t a very consistent runner. I ran the Pocatello Marathon in 2006 but I hadn’t done much since then. Once I started the masters program, my free time became very limited. I had been gaining weight for a few years and in December 2007 I hit 239 lbs on the scale. I decided that if I wanted to run again, I needed to lose weight, so I altered my eating habits and gradually shed some pounds. I played a tiny bit of basketball off and on for the next two years, and I did a little hiking. Around 2009 I started jogging a couple miles a couple times per week with a friend. We would just run back and forth on a mile long grass strip near my house since I was pretty heavy and that was easiest on my knees and shins. Finally I graduated in May 2009 and decided it was time to sign up for a marathon. I picked the Hoover Dam Marathon which was a 4 hour drive away near the Nevada/Arizona border. I trained for the marathon by just running, and especially trying to work up my Saturday morning mileage. Beyond just running 3 or so times per week, I really had no concept of how to properly train. Nevertheless, I worked my way up to a ~21 mile run one hot Saturday morning. I would frequently run past a drinking fountain so I could refill my water bottle in the Arizona heat. Even when I woke up at 5am to run, it would already be light and 90+ degrees Fahrenheit outside. Just at the peak of my training, 3 weeks before the Hoover Dam Marathon, I injured my foot. I had gone camping on a Friday night and when I woke up on Saturday morning I had a sharp, nagging, pain in a tendon on the side of my foot. I didn’t think anything of it, but I could still feel it on Monday morning when I woke up to do a 10 mile run. About 5 miles into the run, the pain suddenly worsened, but being stupid and stubborn I still finished the 10 miles. I hobbled around for the next two days and I couldn’t run a step without pain. Due to the pain, I took the next three weeks off, which happened to be the final three weeks before the marathon. I hoped I’d still be in good enough shape to run a decent race. I really had no idea what kind of time I was capable of, and I hadn’t run a marathon (or even a half) since September 2006. This would be my sixth marathon. In my head I was thinking that a 3:30 to 3:45 would be nice. My wife, two daughters, and I drove to the Hoover Dam the day before the marathon. 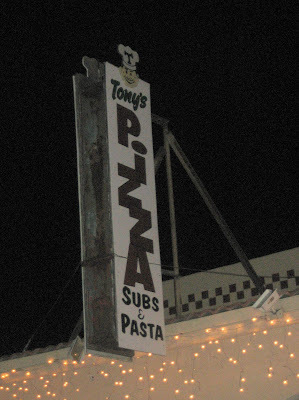 We ate at a pizza/pasta place that we found in Henderson. Beyond this I did zero carbo loading and didn’t even pay attention to what I ate. We stayed at a hotel/casino on Friday night. In hindsight, I don’t know why I never took the time to do a simple “carbo loading for marathon” Google search. I just assumed carbo loading meant eating spaghetti the evening before the race. Since we had one daughter nursing still, we decided that Cyndi would sleep in one bed and take care of her, and I’d sleep in the other bed with our 2-year-old, Paisley. At one point early in the night, Paisley rolled out of the bed, so for the rest of the night I half-slept and held onto her. Besides the threat of rolling, Paisley is notorious in our family for being a light and wiggly sleeper. I didn’t get much sleep that night. My friend, Dan, who I hadn’t seen in years, was also running the race. He picked me up early in the morning and we were excited. We reported to the starting line and started running once the gun went off. 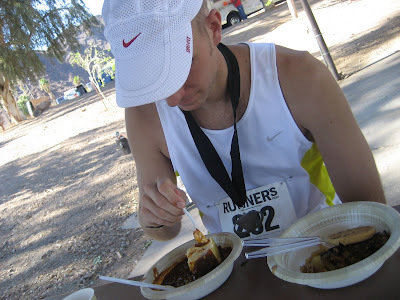 I think the course has been changed since 2009, but at the time the Hoover Dam Marathon was set up as a double out-and-back. We first ran to an overlook above the dam and back, then we ran the opposite direction and back. This meant zero net elevation gain, but there were some little rolling hills. The course was part pavement, part dirt and went through a cool train tunnel in addition to running onto a parking garage overlooking the Hoover Dam. Dan and I ran together for the first part of the race, and I pushed the pace way too hard. I don’t recall too many details, but I remember looking at my watch around Mile 10 and saying “wow, we’re cookin!” I didn’t realize at the time that this should have worried me. Finally around Mile 11 or Mile 12, I started to feel some fatigue. I began to slow down. At first Dan slowed down with me, but eventually he kept going and I really slowed down. I realized it was going to be a pretty long second half, but I still hoped to be able to pull through. I had never resorted to walking in my first 5 marathons and I didn’t plan to today. I crossed the half way point at about 1:45, which is what I was tentatively planning on, but I knew the second half was going to be much tougher. I kept chugging along and approached a climb right around Mile 15. I suddenly had a wave of fatigue and became very light-headed to the point where I thought I might faint, so I started walking. I was disappointed to be walking with 11 miles still to go, but at least it cleared my head. Unfortunately, this also gave my legs a chance to tighten up. I’ve seen many people that can walk and then begin running again, but I’m generally not like this. If I’m on the latter part of a long run and I begin walking my legs will begin to hurt a lot worse than if I’d never walked in the first place. This was the case when I started walking at the Hoover Dam Marathon. After that point it became very difficult for me to run more than 100 yards at a time. I continued my walk/jog as runners began to pass me on their way back to the finish. Eventually I saw my friend Dan. He had slowed down but was doing much better than I was. When I arrived at the turn-around aid station around Mile 20 I stopped and took a break. I ate some pretzels, got a drink, and tried to regroup. I think I was there longer than anyone else had been — the aid station volunteers started looking at my questioningly and saying stuff like, “Well, you better get going!” I grudgingly left, knowing I still had 6 miles of agony left to endure. As if the walking and pain weren’t enough, somewhere around Mile 22 a 55+ year-old lady wearing butterfly wings passed me. That is a moment that will be etched into my memory forever. A few miles before the finish I saw my wife, Cyndi, with our two daughters. She had found a spot to cheer for me. She saw that I didn’t look good and thought it was my injured foot, but I told her it was just a bad day for me. Finally I hobbled into the finish line. I gathered all the energy I could to be able to jog the last 200 yards or so. I must have been moving at about 12min/mile pace and Cyndi later told me it took an incredibly long time. Dan was ready to leave since he had finished a long time before me, so I told him goodbye shortly after finishing. My final time for the Hoover Dam Marathon was 4:48:01, making it my worst time by about 45 minutes in the six marathons I had completed up to that point. While the first half took about 1:45, the second half took 3 hours. It was a bad enough experience that it took me four years before I braved another marathon. Looking back on it, several things went wrong, most of them due to ignorance and ill preparation on my part. It taught me that I couldn’t just show up and run like I did in my first two marathons a year out of high school. It was a failure for me by most measures. Not so much because the time was worse than my expectations, but because I completely fell apart so early in the race and had to walk so much. While the failure wasn’t pleasant, it has been something I can look back on and strive to prevent it from happening again. Plus, I was able to finish, which made for six completed marathons.